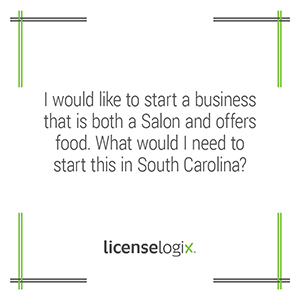 What SC licenses are required for a Salon and offers food? To operate a salon in South Carolina, you first must hold a salon license with the South Carolina Department of Labor, Licensing, and Regulation Cosmetology Board. The application fee is $100 and the license must be renewed annually. Individual employees of the salon must also hold licenses depending on the type of service they provide. The business will also need to complete a state tax registration with the South Carolina Deptment of Revenue. If you would like to serve food in the salon, you will need to hold a retail food establishment permit. These are issued by the South Carolina Department of Health and Environmental Control. Finally, on the local level, your business must hold a business license for the City of Greenville, South Carolina. Do not let licensing requirements stand in the way of a successful business. Our licensing specialist can take care of the entire process to ensure your business is in full compliance with all state and local laws. You can contact a licensing expert by clicking submit a question or by calling (800) 292-0909 or you can speak to someone via our live chat.